Most people feel that having twins means matching names, outfits, toys, and meals. It can be difficult to avoid falling into the same trap that most parents find themselves ensnared in. It may seem like innocent fun to have your twins paraded around in the same color clothing, and when they seem to be inseparable it's downright heartwarming. Eventually your children will find they enjoy different things and people. What can be done to help your twins stayed connected to one another while forming their own identities? It's a lot simpler than it sounds. In fact, it's actually fairly instinctual. Below are three ways in which you can nurture your twins' individuality without being overt or nagging in your techniques. The first and easiest way to give your twins assistance with being individuals is to avoid completely coordinating newborns' lives as if they were a matching set. Names like Shelly and Kelly or Tyler and Skylar are an excellent illustration of an early first mistake. It can be tempting to opt for the commonplace naming habit that parents of twins usually fall into. If you name your children matching names, then you're almost certainly making a clear statement that they are one half of a whole rather than their own person. Avoiding this is one way to make fostering individuality in the future far less difficult, and especially since names and labels are very highly linked to a person's individuality. This is also true for clothing choices, choices of friends, and their leisure activities. Blogger and mother of twins Gina Osher encourages parents to think outside of the box in this regard, and support twins' existence as individuals from early on. This is extremely valid as children tend to fall into the routines and patterns that are established from infancy and starting off on the right foot can ensure that twins have their own separate selves. 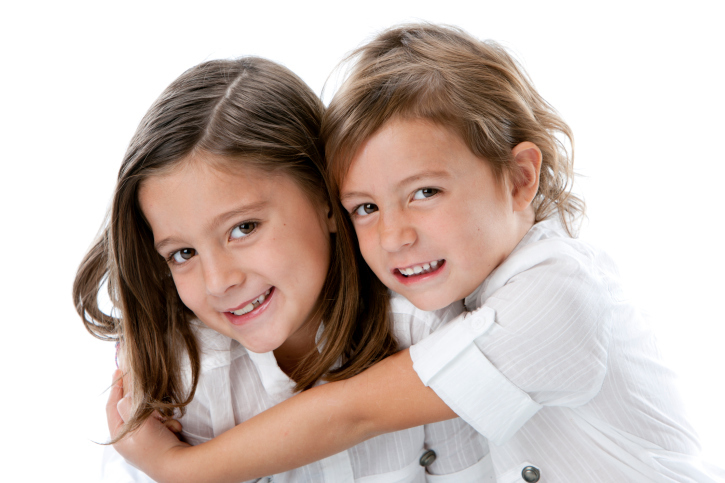 This will help to prevent parents from encountering future patterns and behaviors from one twin that exhibit co-dependence or aversion to their counterpart, which can be troublesome for the entire family. Another necessity for individuating twins is to be sure that each child has their own separate bonding experience with their parents. Songwriter and producer Desmond Child explains the crucial ingredient to success with raising well-adjusted twins is one-on-one time with each child on his or her own. If children feel that they must always compete with their sibling for the attention of the most important figures in their lives, they may not feel as valued or connected to their parents as they should. This can become a problem once children reach the age where having a healthy attachment with their parents becomes most vital, the teenage years. Children who do not have strong attachments to their parents seek these close attachments elsewhere, and this may lead to poor choices that have very dangerous implications. It should also go without saying that twins beginning to show interest in separate things must be encouraged to do so rather than urged against it. 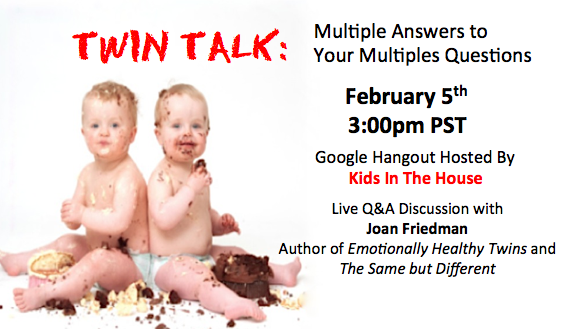 Psychologist and twin expert Dr. Joan Friedman explains it is completely unnecessary and counterproductive to a child's development to have twins constantly nurturing their relationship with each other while snubbing outside relationships that are exclusive to each individual. Twins have been nurturing their relationship with each other their entire lives and must eventually learn to have healthy interactions aside from their kinship to one another. The same can be said for differing interests and preferences. All children, not just multiples, will go through their own phase of finding and expressing their individuality. To curtail this means stunting a twin's personal and social growth. Individuality is an issue that must be addressed as twins develop and grow and should be addressed. This will keep each child happy and secure with himself or herself while giving them their own personal pride and self-worth. The three things above will help to make life easier on twins and the rest of the family. I was a twin and it helped that we were in different sports and in different classes growing up. Our girls are twins and they are completely different. It is really interesting to see them together.